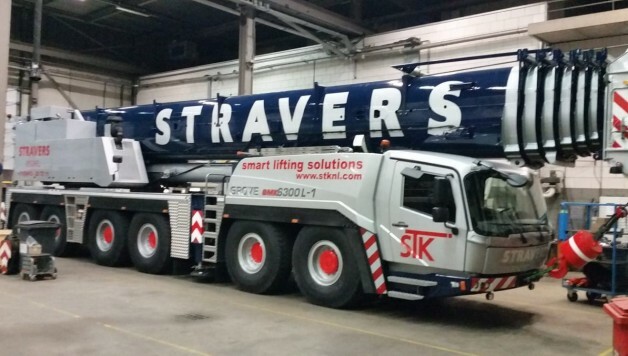 Stravers Torenkranen expanded her rental fleet with a new mobile crane: the Grove GMK 6300L-1. The Grove GMK 6300L-1 is a follow-up to the populair GMK 6300L. Several improvements have been made, which have significantly improved load charts. The mobile crane is equipped with a main boom of 80 meters long and 37 meter of jib. This crane features therefore a maximum tip height of 120 meter (394 ft). The main boom can lift up to 14 t within a 14 to 28 meter working radius. Also, the engine is more economical than its predecessor. The Grove GMK 6300L-1 sets a new benchmark for the industry as to reach, capacity and mobility.